The numbers are in and it seems that the #BlakeArmy continues to grow. Series 4 was the most popular series of The Doctor Blake Mysteries to date. Audiences were up by 4% on previous series, dominating the Friday 8:30pm timeslot, with more people tuning in to Doctor Blake than all other channels put together. Doctor Blake was also the most time-shifted program for the ABC so far this year. The team at December Media is now working hard on Season 5 to captivate and grow audiences once again in early 2017. Fancy Boy, a new six-part sketch comedy show, commenced production in Melbourne this week. The show, which has grown out of the three year Fresh Blood initiative to uncover exciting new talent, finds comedy in the stranger corners of suburbia: in the couple whose communication breakdown leads to a kidnap; in the artist who loses everything over his obsession with fart sounds; in the mum who struggles to accept her missing teen back into the family, mainly because he returns with a full beard and a foreign accent. It’s twisted and tender, a comedy that lives somewhere between the moody and the downright dark. It’s an itch that starts out small, but quickly turns into a weeping sore and before you realise it, you’re all out of anti-fungal cream. Fancy Boy introduces five fresh faces to sketch comedy (actually they’re not that fresh, in fact some of them look quite unwell), John Campbell, Stuart Daulman, Greg Larsen, Henry Stone and Jonathan Schuster (but please do not give out any of these names to Social Security). And for this series they are joined by award winning comedian Anne Edmonds. Fancy Boy will premiere on the ABC in Australia and Seeso in the USA late 2016. Fancy Boy is produced by Nicole Minchin, series produced by Declan Fay, executive produced by Stuart Menzies and directed by Colin Cairnes. A December Media production in association with Checkpoint Media and Fancy Boy TV Principal financier Screen Australia developed and produced in association with ABCTV and Film Victoria. The Doctor will be back! The ABC has announced that our number one locally produced drama series, The Doctor Blake Mysteries, has been commissioned for a fifth series. DOCTOR BLAKE- SEASON 4 RETURNS WITH A BANG! The Doctor Blake Mysteries returned on Friday 5th February to continue its run as Australia’s #1 drama with a total audience of approximately 1.685 million. Congratulations to cast and crew on another fantastic series premiere. Filming has started on December Media’s 3D IMAX film Life in Space – a follow on from the box office success Hidden Universe 3D. With the Islands of Hawaii as its backdrop, Life in Space explores the tenacity of life, transforming lava deserts into living Edens. From the depths of the Pacific Ocean, to the ice moons of Jupiter and Saturn, beyond our solar system and out into the far reaches of space as we search for the essential elements needed to sustain life. Life in Space is the second 3D film in December Media’s four-film journey into space. The third film Earth Story is due to start production in September this year. Like the very successful Hidden Universe 3D these will be produced in partnership with Swinburne University Centre for Astrophysics and Supercomputing with investment from Film Victoria. With the fourth film in development December Media is cementing its place as Australia’s only 3D Giant Screen production house. December Media’s Head of Giant Screen Production Stephen Amezdroz says, “As knowledge of our planet grows, so to does our understanding of the possibilities out in universe. Biology is no longer just the science of life on one planet but of all planets. “A new science called Astrobiology is changing the way we think about life on Earth and beyond. In any great detective story if you profile your suspect you have a greater chance of finding them, and so it is with our search for life in space,” says Stephen. 3D Computer Generated Images are being created 8K per eye representing the highest levels of CGI detail yet used in an IMAX / Giant Screen Film anywhere in the world. Life in Space is due to be released in the summer of 2016. December Media’s third film Earth Story takes us on a visual journey to see our world during its birth, its infancy and its adolescence. Earth Story allows viewers to see our home’s glorious history using the power of 3D IMAX to discover that our world was once stranger than science fiction and more visually spectacular than our wildest dreams. The nominations for the 2015 AWGIEs have been announced. December Media is thrilled that Stuart Page’s script for Darkness Visible in The Doctor Blake Mysteries, Series Three, has received a nomination in the Television – Series category. Stuart has written for Series 1, 2, and 3. Season three of The Doctor Blake Mysteries starring Craig McLachlan and Nadine Garner is the highest rating of all three series and is the number one returning drama series in Australia this year to date. So December Media’s Executive Chairman & Creative Director Tony Wright began the party to celebrate the remarkable achievement of the company’s 18 years as an Australian success story. Growing from a small factual business to a burgeoning drama production company and, now one of the biggest giant screen producers in the world. 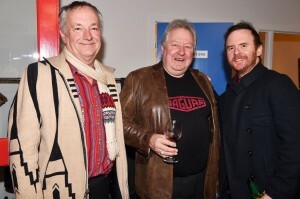 Friends from the film and television world came together to raise a toast to the new offices, welcome the new CEO Stuart Menzies and celebrate the continued domestic and international success of the December Media product. It’s a bright future with many more innovative, exciting and entertaining ventures still to come. Executive Chairman of December Media Tony Wright announces the appointment of Stuart Menzies as new CEO. After 10 years at the ABC Stuart has returned to the production sector. His roles at the ABC included six years as Head of Documentaries moving on to becoming the First Controller of ABC 2, which he grew into a vibrant, alternative offering for the national broadcaster. Menzies replaces Heath Watt, who departed as the Sydney-based MD in early March for personal reasons. Stuart Menzies said, “I loved my time at the ABC but I am an independent producer at heart. December Media has been a first rate company for many years producing a string of great shows and opportunities abound for growth. Stuart and his family recently returned to Melbourne from Sydney and he has started in the new post. Experienced Giant Screen/IMAX film production house, December Media and specialist natural history filming company BioPixel are pleased to announce that they have finalised an agreement to develop and produce three 3D Giant Screen/IMAX films. The deal will commence with the development and production of their first film focusing on the world’s largest living structure, Australia’s Great Barrier Reef. Great Barrier Reef – 3D is currently in advanced stage of financing and is scheduled to commence shooting March 2015. Emmy Award winning Victorian based company, December Media is the production house behind Giant Screen/IMAX hit, Hidden Universe 3D. Hidden Universe 3D has been in the Australian Top 10 box office in both 2013 and 2014. December Media is also currently in production on two new 3D films with Swinburne Universities Department of Astrophysics and Supercomputing, Life in Space 3D and Earth Story 3D. BioPixel is a Queensland company based at James Cook University in Cairns. Founded by telecommunications entrepreneur Bevan Slattery and Emmy award-winning cinematographer and marine biologist Richard Fitzpatrick, BioPixel brings to the partnership an unequalled knowledge and understanding of the diversity that is the Great Barrier Reef along with a focus on the latest image capture technologies like 5K filming and high speed shooting. Shooting for Great Barrier Reef – 3D will begin in March 2015 with scripting on a further two films commencing around the same time. November 21st, 2014 – The Doctor Blake Mysteries (Season Two) has been nominated for Best Drama Series at the 19th Asian Television Awards. The Awards night is on 11th December…watch this space. 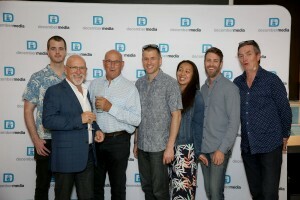 September 17, 2014 – December Media, leading independent content production company (Doctor Blake Mysteries, Mrs Biggs, Hidden Universe), today announces the appointment of former Rival Media Limited (“Rival”) Managing Director, Howard Myers as its new Head of Non-Scripted commencing in late 2014. Howard has held numerous senior production and executive roles, including stints with Disney Channel in the UK, Disney-ABC International in Los Angeles and more recently establishing independent production company Rival in the UK. Heath Watt, December Media’s Managing Director, said “We are delighted that we were able to entice Howard to join the December Media team. Howard’s experience in developing, pitching and producing non-scripted content of all scales will be the foundation for the realignment of December Media’s factual and non-scripted business. Howard will initially undertake consultancy work for December Media from the UK and then join the Australian operation later in the year. Howard will work closely with the December Media team in the main office situated in Melbourne. December Media is currently scoping Sydney locations for an office, from which Howard will ultimately be based. April 10, 2014 – The Doctor Blake Mysteries (Season One) has this week received a prestigious Silver World Medal for Best Drama at the New York Festivals World’s Best TV & Film 2014 awards. The New York International festival honours the world’s most outstanding in the television and film industries with 50 countries competing for the coveted awards. The international win is yet another reason for celebration for the show and its producers, December Media, with this week’s announcement of the commencement of scripting for a third season of The Doctor Blake Mysteries. This comes on top of the recent announcement the star of the show, multi‐award winning Craig McLachlan, has been nominated for Most Outstanding Actor in this year’s TV WEEK Logies awards. Writers will now map out the twists and turns of the new season with promises of even bigger mysteries to uncover, more Blake secrets to unravel and a few surprises along the way. Season Three is expected to film later this year, returning to the iconic town of Ballarat. The Doctor Blake Mysteries is an Australian drama success story. Its final episode of the season screens this Friday (April 11 at 8.30pm on ABC1). The series enjoys recognition on the world stage selling to international markets including the United Kingdom, Europe and New Zealand. ABC TV to investigate more DOCTOR BLAKE! April 07, 2014 – ABC TV is thrilled to announce that development is underway on the next installment of ABC1’s hit drama series, The Doctor Blake Mysteries. Since premiering earlier this year, the second series of The Doctor Blake Mysteries, has become essential Friday viewing attracting a combined metro and regional series average of 1,553,000*. Starring the multi Logie award-winning Craig McLachlan and AFI award-winner Nadine Garner, the series is produced in partnership with producer George Adams at Melbourne’s December Media. The success of The Doctor Blake Mysteries in Australia is now being mirrored overseas with the series being sold into international markets including the United Kingdom – screening on BBC1, around Europe, New Zealand and negotiations are currently in progress with the PBS network in the United States. The final episode of series two of The Doctor Blake Mysteries airs this Friday 11th April at 8.30pm on ABC1. *OzTAM & RegionalTAM Consolidated data (Feb 2014). February 25, 2014 – December Media, a leading independent content production company (The Doctor Blake Mysteries, Mrs Biggs, Hidden Universe 3D), announced today the appointment of former WTFN Commercial Director, Heath Watt as its new Managing Director, commencing early March. 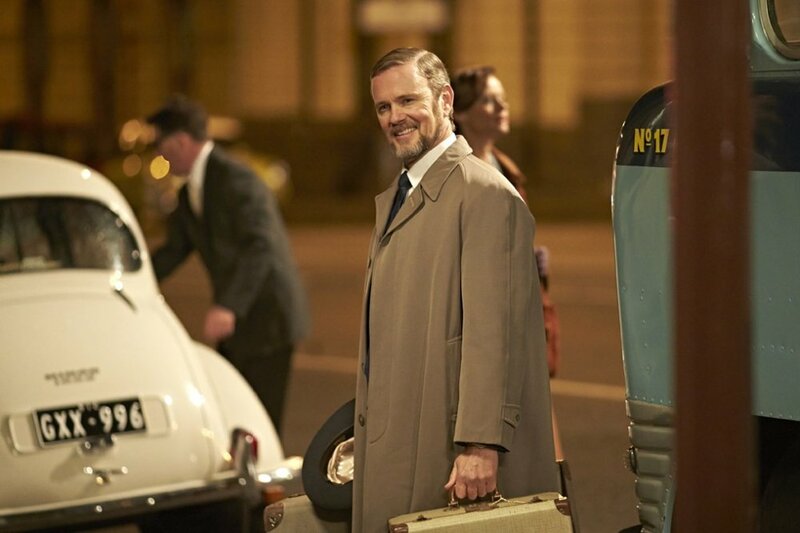 February 14, 2014 – Itʼs been a big week for Doctor Blake. The premiere episode of The Doctor Blake Mysteries, last Friday night (8.30pm), notched up fantastic figures for a returning series on ABC1 and to cap that off the show has been named as a finalist in the drama category at the New York Festival Awards 2014. It is the only Australian drama to be nominated. Series One of The Doctor Blake Mysteries has been nominated alongside some impressive dramas including Orphan Black (Canada), Black Mirror and Peaky Binders (UK), The Vikings (USA) and The Blue Rose (NZ). The 2014 Awards will be held inLas Vegas, in April. In a week of noisy success for Australian TV drama The Doctor Blake Mysteries proved itself once again to be the quiet achiever for the ABC. Episode One attracted 1.399M (OZtam) viewers not including catch-up. Season One of The Doctor Blake Mysteries was a phenomenal success on ABC1 and was also screened in the UK on BBC1. Audiences have taken the show to heart embracing the maverick doctor (Craig McLachlan), his steadfast housekeeper Jean (Nadine Garner) and their world of medicine and mystery. This weekʼs episode (Friday 14 February) we find ourselves in the world of Rock ʻnʼ Roll after a star collapses in the arms of his fans. The music is here to stay but not too many people in the quiet City of Ballarat are keen on this new fad. In contrast there is a touring religious road-show in town and that brings with it a “Billy Graham” like fervour. God versus the Devil has never been more clear-cut than this. Cameron Daddo is wonderful as the Evangelist. And look out for the fabulous scene with Dr Blake and housekeeper Jean by the piano as they try and get their heads around this new Rock ʼnʼ Roll craze. The Doctor Blake Mysteries is a December Media Production in association with ABC TV, Screen Australia and Film Victoria. Producer George Adams and Executive Producer Tony Wright. ABC Executive Producers Christopher Gist and Carole Sklan. series Mrs Biggs has won the Best Editing in Television Award at the 3rd inaugural AACTA Awards in Sydney this Tuesday. The mini series has been edited by Ben Lester (UK) and Mark Atkin (AUS). The latter received the prestigious award at the AACTA Awards Luncheon yesterday. Mrs Biggs is the true story of the woman behind Britain’s most famous villain, Great Train Robber Ronald Biggs. It is the inside story on one of the most infamous crimes of the twentieth century; but more than anything it is a sweeping love story told across three decades and from one side of the world to the other. All winners and nominees are listed on the AACTA homepage. with a knack for solving crimes and he is back on Friday nights from February 7 at 8.30pm. After the phenomenal success of series one, series two of The Doctor Blake Mysteries starring Craig McLachlan has been fast tracked. Filming of the second season only finished December 2013. This season in The Doctor Blake Mysteries, Doctor Lucien Blake returns to Ballarat after an attempt to reunite with his long lost daughter. But itʼs no longer the safe haven he left behind: Danny has been transferred to Melbourne, replaced by a new Senior Constable who seems hell bent on making Blakeʼs job as police surgeon as difficult as possible. Blakeʼs old nemesis Patrick Tyneman has called in the help of some powerful men to keep an eye on Blake. And of course there are the strange and baffling murders that come his way, there are mysteries seeping out of every corner – from political corridors and church vestries, to, art galleries and rockʼnʼroll halls. Nothing is sacred? And no one is safe? Leading the cast is Craig McLachlan as the intriguing Dr Lucien Blake. Nadine Garner plays his reliable confidante Jean Beazley, Cate Wolfe is the headstrong nurse Mattie OʼBrien, Joel Tobeck the tenacious Chief Superintendent Matthew Lawson and a newcomer Charlie Cousins plays the inscrutable Senior Constable Charlie Davis. Santa! December Media has been very very good this year! December 12, 2013 – Itʼs been a glittering year for December Media with three of the companyʼs flagship productions receiving high recognition. December Mediaʼs acclaimed mini-series Mrs Biggs has received eight AACTA nominations, The Doctor Blake Mysteries was the ABCs highest rating program of all ABC shows for 2013 at 1.9 million viewers on average each week and its film 3D Hidden Universe is currently two at the box office for Australian films on the basis of audience per screen. And to top it off, it seems that the UK audiences can’t get enough of the good Doctor Blake, starring Craig McLachlan. The series telecasts on BBC1 at 2.15pm Mondays with more than 1 million viewers. Reviews in the UK have unanimously praised the show. The Australian drama series set a precedent recently as the first ABC commissioned television drama series to be telecast on the pre-eminent national broadcaster. The Doctor Blake Mysteries also picked up the APRA award for Best Television Theme (Dale Cornelius) and Carrie Kennedy Adele Flere, Kate Russell & Rob Molnar won the APDG award for Best Design on a TV Drama. The AACTA Nominations included Best Telefeature or Mini Series; Best Lead Actress in a Television Drama – Sheridan Smith; Best Cinematography in Television; Best Editing in Television; Sound in Television and Best Original Music Score in Television. Earlier this year December Mediaʼs five-part mini series about the true love story between Charmian and Ronald Biggs, spanning 30 years and three continents, received a BAFTA Award for Best Leading Actress (Sheridan Smith) and Best Mini Series Nomination, BAFTA Television Awards 2013 as well as an International Emmy nomination for Best Leading Actress. Hidden Universe, released in September this year, is currently number eight at the box office for Australian films with the expectation it will end up the year in second or third position after The Great Gatsby. The 3D film has released on 22 screens worldwide. The Doctor Blake Mysteries (Series Two) wrapped last week after a successful five months shooting in the gothic town of Ballarat 115km north west of Melbourne. The 10-part series set in the late 1950s, stars Craig McLachlan as the intriguing Dr Lucien Blake. 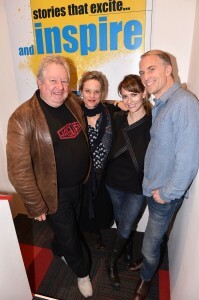 Nadine Garner plays housekeeper Jean Beazley, Cate Wolfe is the district nurse Mattie OʼBrien and Joel Tobeck the tenacious Chief Superintendent Matthew Lawson.